Hexo+ is a hexacopter with an automated camera that can be maneuvered in plenty of ways to capture the cinematic shots. 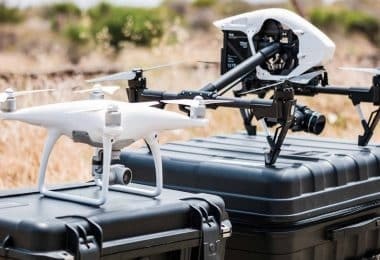 It is the only drone we know with such a huge emphasis on aerial photography as seen in the immense features of its customized camera movements. The drone is made to be hands-free, unlike other popular hexacopters and quadcopters that require a pilot to control them with the remote. With this model, all you need is a compatible smart-phone that is preferably powered by either the Android or iOS to install the Hexo-designed app. 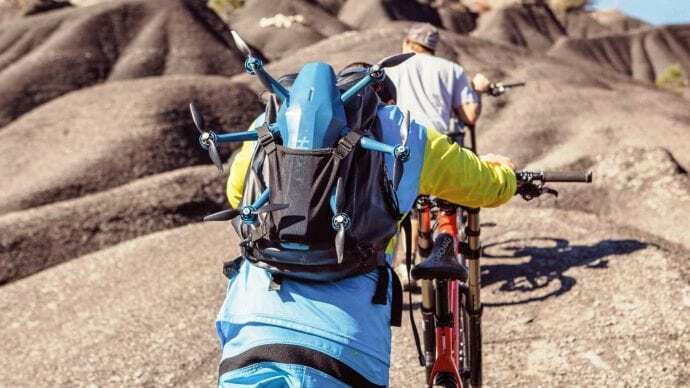 Filmmakers and other sports-actions photographers will fall in love with the versatility and maneuverability of this drone with its automated and competitive camera shots for both photos and videos. All the camera movements can be controlled by the pre-programmed app to capture amazing shots from any direction. For example, it can hover in an orbit around you, or move towards you or away from you. 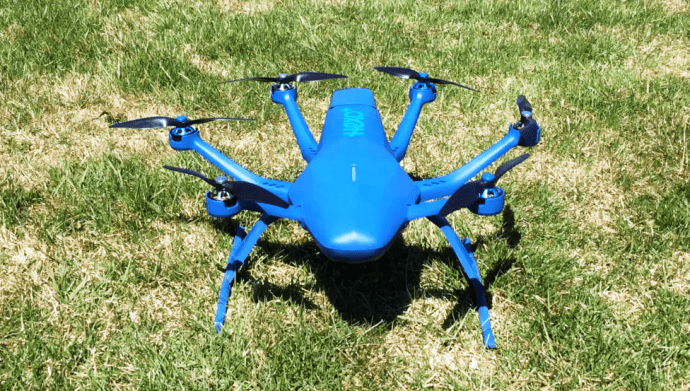 Almost any movement you can think off, that might not be practically possible to a human photographer, can be accomplished by this compact hexacopter. It has a constant framing and tracking for image stabilization, and can capture athletes running as fast as 45mph (70km/h). Be aware: This drone is not designed to be controlled manually but entirely automatic. From auto-start to auto-landing, all commands are achieved through the installed mobile app. There’s thus no remote to get your hands on to control its movements. So, if you want a manual control of this aerodynamic drone you will have to make a plan to get the RC controller which is not included with the purchase. You have to purchase it separately, but bear in mind that it voids warranty if used. Furthermore, you need to connect either, Futaba SBus receiver, Spektrum DSM, PPM RC receiver or DSM-X Satellite receiver or any other receiver as long as it is compatible with the RC controller for manual control of the drone. So, if you are into manual control of drones, this is not the ideal model for you. 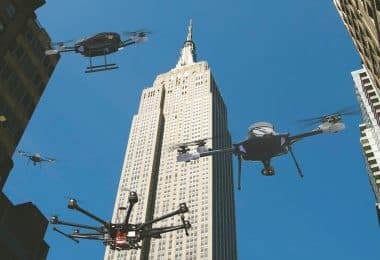 But thinking of it, it is a great option for those who have never flown a drone before because manually-controlled copters often require some extent of technical knowledge to get them flying. The Hexo Plus is sky-blue in color. Imagine if you were to control it manually, how confusing it will be to control in relation with the sky-blue sky as well? The automatic mode isn’t a problem after all. 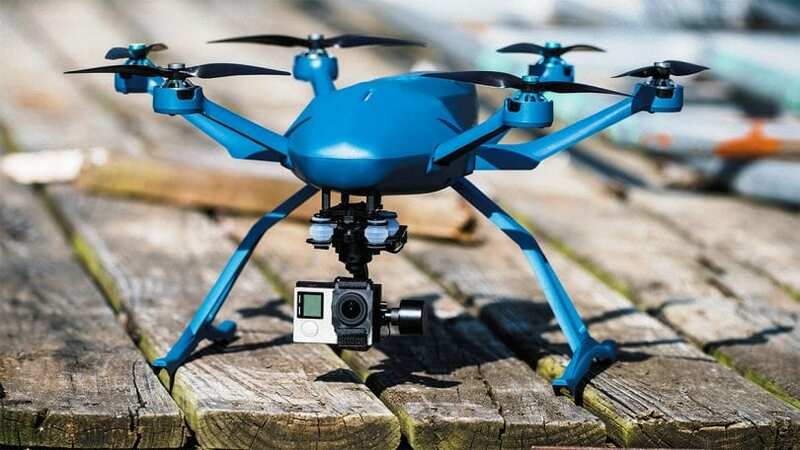 The drone is an RTF (ready to Fly), so there is no need for any further assembling needed except inserting its battery and also purchasing a recommended GoPro camera to be mounted on its 3-axis Gimbal. You can purchase any GoPro model of the camera as long as it is compatible with the Gimbal. The drone further comes complete with all other parts including landing gears and 6 tiltable propellers. Also important to have is the compatible smartphone to get the drone flying in no time. For more info about how it works and how it captures amazing aerial images, visit its manufacturer site to get a glimpse of this drone. Another piece of advice: if in the US, you need to register your drone with the FAA as it is legally binding to do, more especially for huge drones like this one with dimensions 9.6 x 17.1 x 16.1 inches. Surely there are other similar regulations in almost every country, just make sure you comply with them. The other important advice is that you should purchase additional batteries to replace the first one if it runs out. But only purchase the recommended and compatible batteries. We reckon you purchase from the same manufacturer of the drone. As you purchase your drone, beware of possible imitations that are notorious for non-durable materials. Popular drones such as this one often face the possibility of being imitated. Just make sure that you buy from an accredited seller where guarantee is provided. In addition to the components in the package, you might need to purchase the receivers and the RC controller if you adore using the manual instead of the autonomous mode. Also recommended is to buy an additional battery to replace the given one if power gets depleted because it can take about 40 minutes to charge it. The Hexo Plus hexacopter is powered by 6 rotors, and has small propellers that remain close to the body. These propellers are clothed with colors to match with the drone. For example, 3 of them are metallic blue and the other 3 silver in color. Meanwhile, the overall weight of this drone is 3.8 pounds after mounting the camera and inserting the battery. It is lightweight enough to fly at a speed of 45mph. The drone is made of tough materials that withstand the harsh temperatures in the sky. But bear in mind that it has not been tested to withstand he heavy rains. We assume that it might adversely affect the flight time. 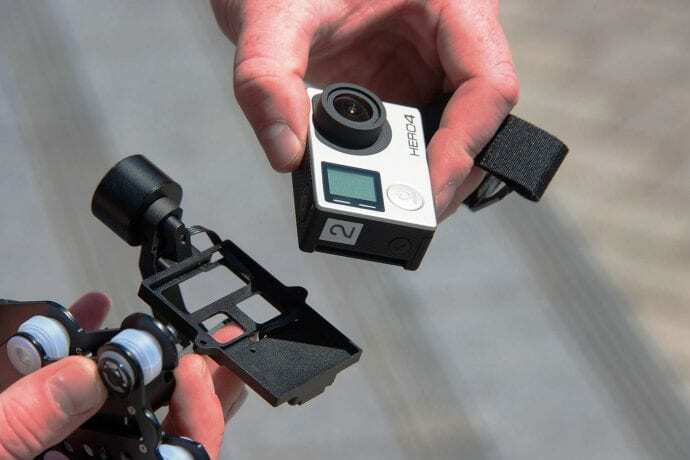 You have to buy the recommended GoPro camera to mount it on the Gimbal featured. This camera will be secured by the Velcro strip in the Gimbal’s cradle to make sure it doesn’t get damaged when the drone lands. 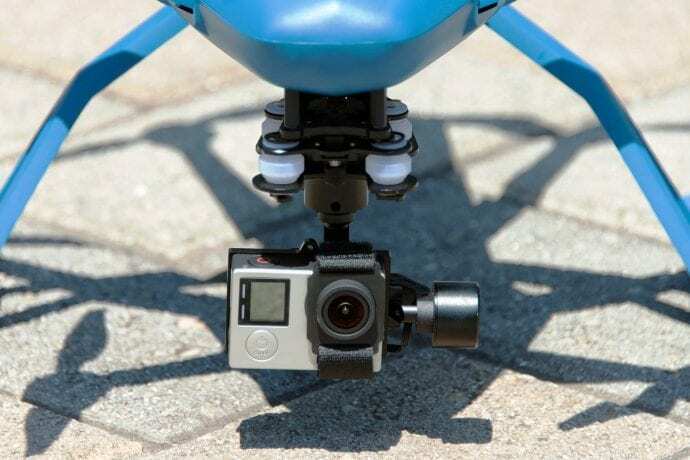 A compatible GoPro camera will follow the commands of the app in capturing aerial photography for either business or for fun. All you need in order to maneuver the camera movements is the included app that can be installed on your iPhone or an Android-powered smartphone. The Bluetooth is needed to pair the app with the drone. The flight time is dependent on the strength of the battery as well as some factors such as the weather conditions. But on average, the drone can fly about 15 minutes. The app will notify you about the battery percentage to calibrate the minutes left for it to land. It will land on the initial position for you to change the battery and that takes a few seconds. A superior flight controller with MAVLINK protocol is featured in this drone to enhance its performance. To experience an optimal performance of this drone, you have to master the control settings as included in its app. The main focus of the drone is the versatility of its camera movements to capture for a wide range of positions to simulate cinematic actions. It might turn out to be challenging at first, more especially when you’re a first-time handler of drones, but the Quick Start Guide can get you there. There is a failsafe feature that may be helpful to novice drone owners if they get stuck with controlling the hexacopter especially in a manual mode. It can fly safely to its starting point if it losses signals or runs out of the battery. This drone predominantly operates in auto-mode whereby only the mastering of the app is paramount. The rest of its movements can be accomplished on your smartphone. For instance, you can hover it or slide it sideways to capture the desired aerial photographs. It has a framing and tracking algorithm to capture any object. 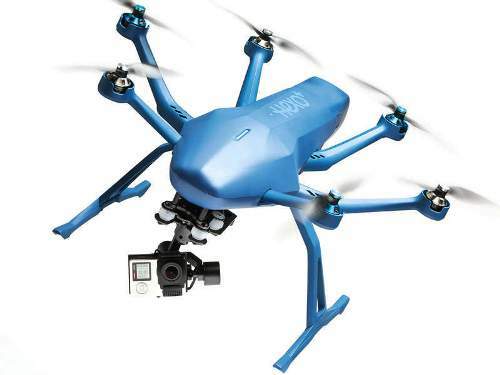 The Hexo Plus hexacopter arrives with most of its components included in its retail price of about $999. However, the battery and the camera will add additional costs of your final package. If you want to fly it manually, you will need to take into account the costs of the receivers that are compatible with the RC controller. The company has not mentioned anything about the guarantee for this product. You can inquire with them prior to making any purchase to stay on the safe side. Hexo Plus drone is made bespoke by its autonomous self-flying camera that can be set to take images from any position. Movie makers will find this camera feature amazing. Even more, the idea of flying the drone hands free is a plus for aspiring drone owners. Only a smartphone app is required to take amazing aerial footages. The drone is super-fast and responsive in all its actions It’s further made unique by the trajectory anticipation, predictive tracking algorithms, framing and stabilized photographs, and a 3-axis Gimbal. View this YouTube to see the amazing footage taken by this drone. When you travel to your desired destination to fly this drone, you can simply fit it in your backpack due to its compact design. The landing gears, the Gimbal and the propellers can be temporarily removed so that it fits in your gear. It is easy to reinstall them in your intelligent drone when you are ready to start. Another unique feature is perfect framing and tracking for image stability so that you continue taking elegant aerial footage regardless of the motion displayed. Thousands of cinematic camera movements are built-in as created by the Hexo Plus motion picture experts. 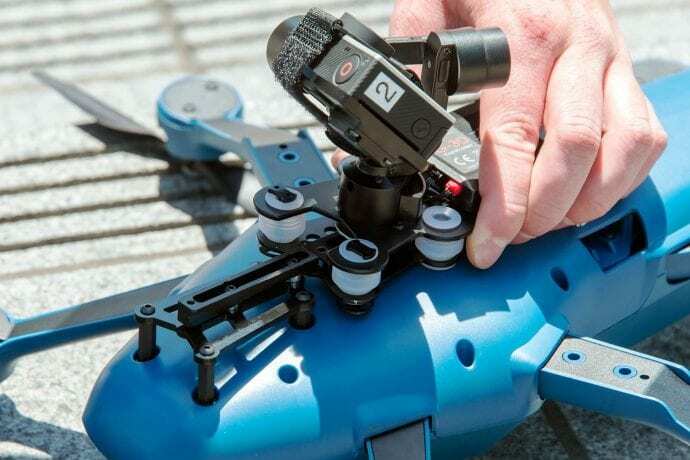 The fact that the feet, Gimbal and the propellers can be removed when you put the drone in the backpack is a proof that the parts can be replaced in case of any damage. But the parts have to be purchased from the manufacturer. For other drones it might be challenging to find the replacement parts. The manufacturer has included the MagicWand feature wherein the drone can hover facing you. By waving your phone to either direction, the drone can follow that waving direction. It can also move away from you or closer to you because of this feature. Did you know that you can track another person or animal with the Cinematographer mode that this Hexo Plus drone has? There will be a live video feed to be sent to the drone’s monitor and you can track a person within 500 meters. That’s an impressive feature that is seldom found in other dones. This is a hexacopter drone just like the Hexo Plus, but comes at a cheaper price. It also comes with FPV thru WiFi and optional video feeds on the smartphone. The drone can fly in many directions as it captures aerial photographs. Nevertheless, the Hexo Plus comes at the top here with its autonomous camera shots hence the expensive price of about $999 compared to the $59 of this hexacopter. This MJX X600 X-Series hexacopter can be ideal for pilots who are not looking for something too professional. 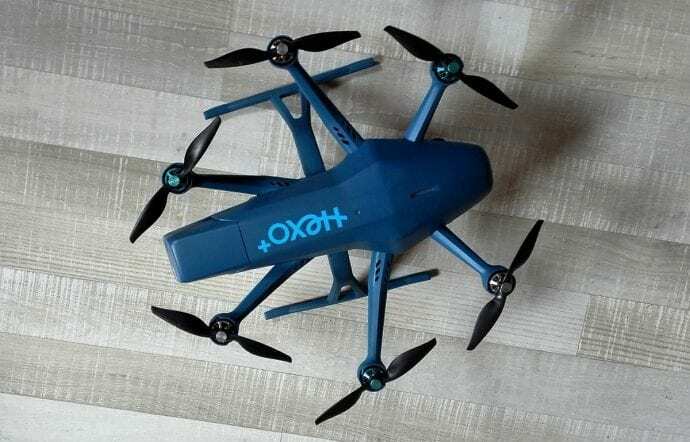 There are many features that are in the Hexo drone, but omitted in this X-Series. This explains why it is cheaper. The FPV camera is optional. Like the Hexo Plus, the Yuneec Typhoon H is also a hexacopter that prioritizes high-quality camera to capture elegant aerial footage. It can be suitable for recreational or business use. 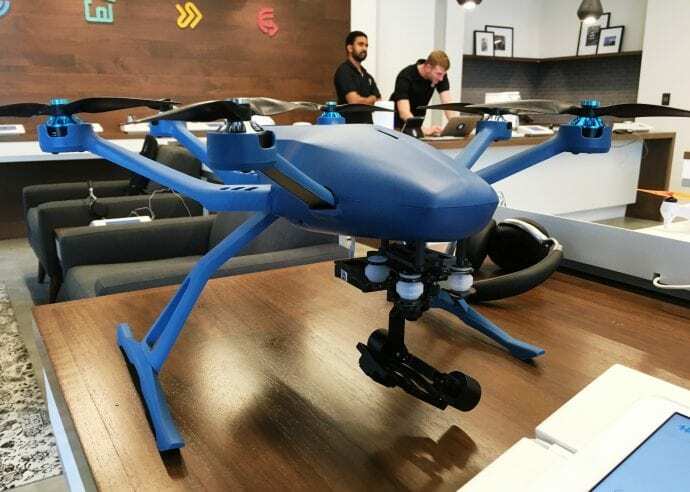 The drone features a Gimbal camera to capture at an angle of 360 degrees, and also has a tough landing gear to protect the camera when landing. 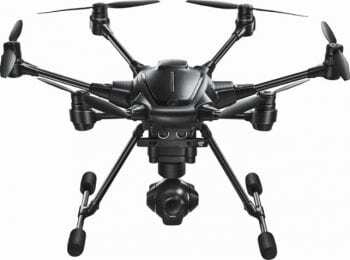 The same can be said with the Hexo hexacopter with its 3-axis Gimbal to hold a GoPro Hero5 high-quality camera. The Hexo drone tops the Yuneec Typhoon H with the overall speed of 45mph versus 43.5mph. However, the Yuneec seems to have more flight time compared to the Hexo. The similarity they share is a “follow-me mode” where the camera can capture your images while biking at a speed of 70km/h. 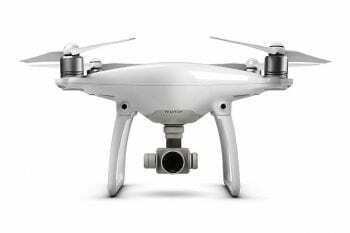 The DJI Phantom 4 is a quadcopter, but has great features that are comparable to the Hexo. For this reason, it can be a good alternative. It tops the Hexo with the availability of obstacle avoidance and a lengthy battery life. Furthermore, it comes with camera resolution of 12MP Adobe DNG Raw, video resolution of 4k at 50 FPS/1080p at 120 FPS. Like the Hexo, it also has a maximum speed of 45mph. However, the Hexo Plus outperforms the DJI with its self-flying camera and 6 propellers whereas the DJI needs a pilot manual manipulation of the drone, and has 4 propellers. 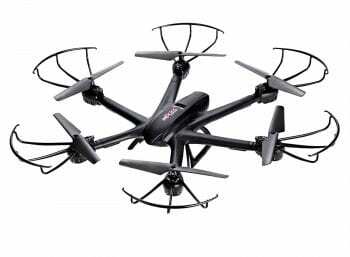 The Hexo hexacopter is perfectly engineered for aerial footage enthusiasts who are determined to use the drone for business or for recreational purposes. The drone has put more emphasis on the excellence of its camera captures. 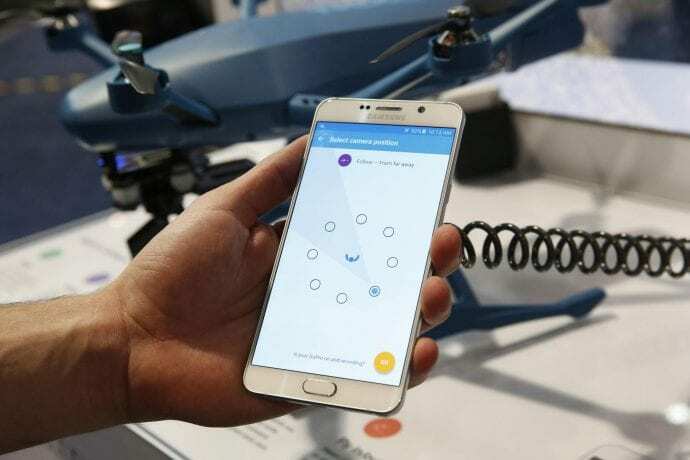 Behind this unsurpassed maneuvers of the drone is the Android or iOS device in which the app has been installed to control the drone hands-free. It starts and lands automatically. Novice drone owners who have never flown a drone before can find this drone easy to fly because of its automatic control. Manual control, on the other hand, requires an RC controller with some compatible receivers. That can be mentally demanding for newbie drone flyers. The Hexo Plus is a great hexacopter for all hobbyists. Its rare camera options and autonomous control are easy to be comprehended even by a newbie. All you need is to have the smartphone ready to install the app that will help you control this powerful drone. The rest will then be performed in the app to maneuver all the desired camera movements. 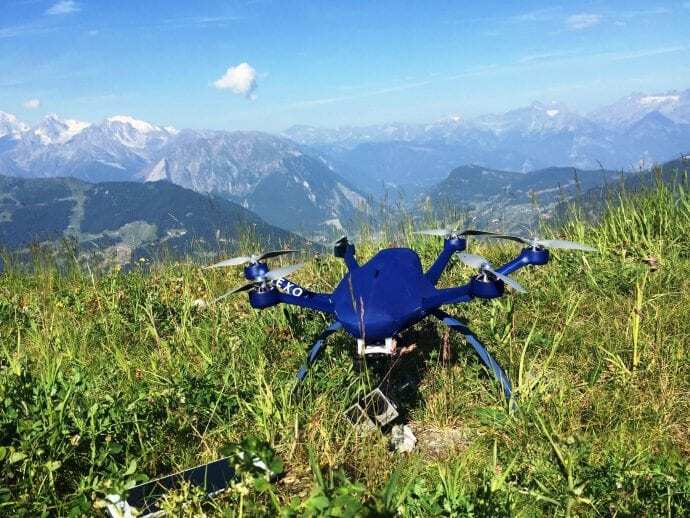 Business-oriented people will find this drone a great and indispensable tool to boost their businesses because it can capture amazing aerial images for filmmakers and action-sports participants. So, if you are a camera enthusiast, this drone is certainly a must-have for you. 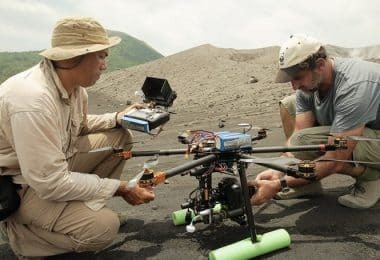 It is the only drone with such an amazing engineering of the customizable camera movements that will enable you to take images in remote areas where a human being cannot. How to Fly A Drone: Everything That You Need To Know About!